I love my crockpot. 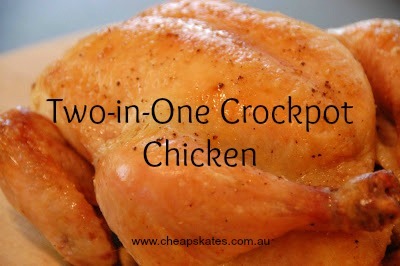 It is used all year round for soups and stews, puddings, roasts, sauces and this simply sensational two-in-one chicken recipe. You start off with a lovely fresh chicken, season it with delectable spices and let it cook until it is so tender the meat falls off the bones. And that's exactly what you want it to do! 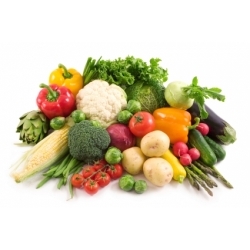 Pick the meat off the bones and use it as roast chicken or in fajitas or pasta or in a chicken salad or chicken pot pie. Leave the bones in the slow cooker. Let it sit for a while to cool down. After dinner, fill the slow cooker with fresh water. Toss in the contents of your broth bucket and turn the slow cooker on. Let it simmer away overnight. In the morning you will have a rich, flavourful chicken stock to use in sauces and gravies, to cook rice or as the base of a delicious chicken soup. Strain the broth to remove the bones and veggie peelings. The measure it into portions and freeze it in ziplock bags or Tupperware containers or clean peanut butter jars - whatever you use to freeze stock in your house. Combine the dried spices in a small bowl. Put the onion pieces in the bottom of the slow cooker. Remove any giblets from the chicken and then rub the spice mixture all over. Put prepared chicken on top of the onion. Cover and cook on high for 4 1/2 to 5 hours or until the chicken is cooked through and falling off the bone. If you are in doubt, use a meat thermometer to make sure it's done. Once the chicken is cooked, remove the meat and start your stock. Leave the bones of your roast chicken, the cooking juices and the remains of the onion in the bottom of the crockpot. Add the onion, celery, carrot, bay leaf and parsley. Fill the crockpot with cold water. Cover and cook on "LOW" overnight. If you are starting your stock in the morning cook for 10 hours. When the stock is done, strain to remove bones and vegetables and then pour the stock into containers. Freeze for future use. I freeze in 2 cup containers for cooking rice, 1 cup containers for sauces and gravies and 1 litre containers for soup. I also freeze some in ice-cube trays to use in place of stock cubes in recipes. With winter in full swing, this stock is the ideal base for Grandma's Chicken Soup, guaranteed to make you feel better whether you have a cold or not.